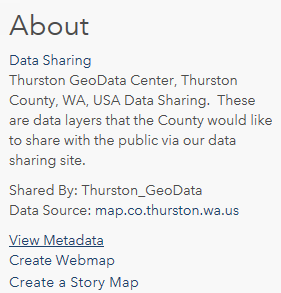 The Overview Tab is a place to get additional information about the data layer (GIS Shapefiles) you are interested in downloading. Once you have found the data you are interested in click on it to bring up the Overview tab. The Overview Tab shows a description of the data, information about the attributes and related datasets. Attributes – Information included in the data. Download & Access – Download or get an API for the data. About - Additional information about the data. Related Data – Other related data suggested for download. The Description section of the Overview Tab gives you quick access to information about the data. From this section you can easily link to the custom licensing information, see the load date, what type of dataset it is and the number of records in the data. You also have access to a description of the layer. This section of the Overview Tab lists the Attribute Fields included in the data and their type (text, number, date, etc). 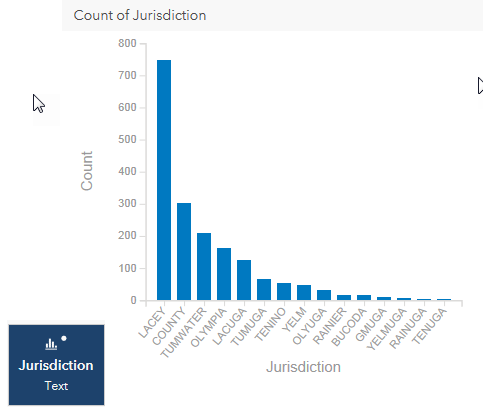 You can click on attributes to get a Chart that shows the number of features by the chosen attribute. These dropdowns can be used download the data or to access the API for use in other online webmaps. The Download dropdown can be used to download the data in Spreedsheet, KML or Shapefile Format. You also have the option of download the full dataset or a filtered version. 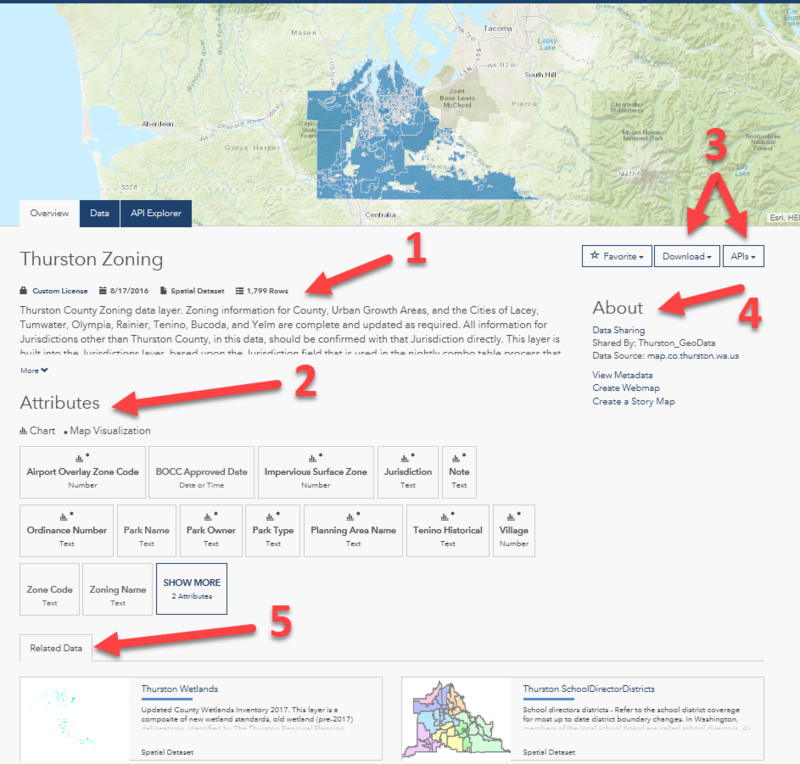 Finally some layers have a Layer File that can be used to display the data using Thurston County Symbology sets. 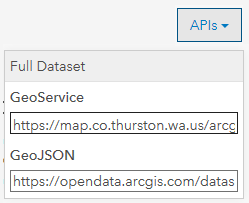 The API dropdown can be used to accss a url for using in web mapping applications. 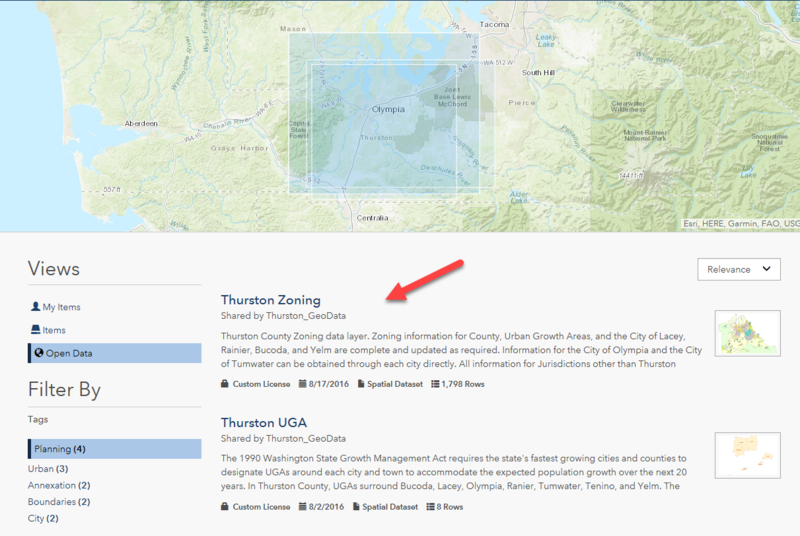 This area of the Overview Tab shows basic information about the data and links to additional data and information including the full metadata. This area is a list of similar data sets available for download on our site. Click on one to be taken to its Overview Tab. Additional information about the data can be found by clicking on the Data or API Explorer tabs.